You may have a land waiting to be tilled and you are wondering what kind of crop to grow. Growing potatoes can be the answer you are looking for. This article will guide you what you need to know to start your own potato farm. Potatoes are one of the most popular and versatile vegetables today. They are great for baking, frying, roasting, mashing and for salads. In the US, Idaho is the largest producer of potatoes, contributing to one-third of the country’s total potato harvest. 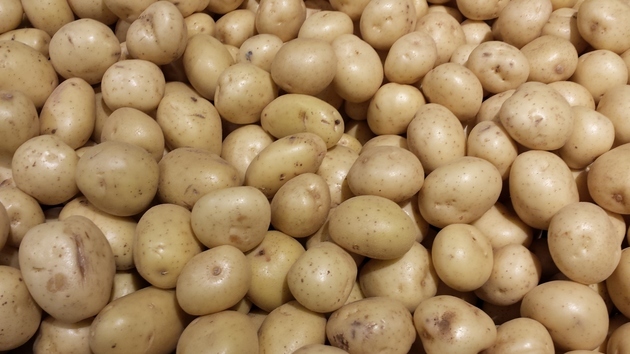 There are more than 400 varieties of potatoes that you can choose from. In starting your own potato farm, you need to decide which variety you want to grow. Best way to find out the best variety for you is to conduct a research among potato farmers in your area. Ask them what works well in their soil and what they like to grow. Remember that different varieties grow better in a specific area than others. You may also want to research what varieties are best for what purpose like boiling, baking or roasting. It will help if you know where you will market your produce after harvest. Example, if you intend to supply French fries vendors, it is best to choose among King Edward, Maris Piper and Sante. The two main types of potatoes are waxy and floury. Waxy potatoes do great for salads or any dish where you want to keep their shape once cooked. Examples are Charlotte and Maris Peer. Floury potatoes, on the other hand, works better for if you want fluffy potato dishes like mashed potatoes. The popular varieties are King Edward, Estima, Maris Piper and Desiree. There are also three types of potatoes depending on the length of time it will take you from planting and harvesting your crop. These are first earlies, which are usually ready in about 10 weeks, second earlies in about 13 weeks and maincrop in more than 20 weeks. Potatoes are grown from small potato tubers called seed potatoes. Farming practices include setting aside around five to fifteen percent from their potato harvest for re-planting. However, one can buy certified seed potatoes from commercial suppliers. To establish your potato farm, you need a well-drained land. The process it takes to grow potatoes includes clearing and preparing the land, purchasing of seeds and planting them, application of fertilizers, herbicide and insecticides, and harvesting. Potatoes prefer a moist, slightly acidic soil. They are greedy feeders though, which means you have to put a good amount of manure or compost in your farm to help feed them and improve soil texture. You can use some comfrey leaves to fertilize your soil. You can wilt them for a day and place them at the bottom of the trench and cover them with a little layer of soil. Another factor that contributes to successful potato farming is the effective management of diseases and insect infestations using chemical fertilizers, herbicides, pesticides and fungicides. Potato growers apply pesticides after planting to prevent pests like late blight and potato beetle. Blight is a fungus appearing in high humidity conditions that spreads over potato leaves causing it to die. Large-scale potato farmers apply pesticides through sprinkler irrigation systems or aerial spraying while taking careful steps not to contaminate groundwater. Potatoes love lots of water and needs a full sun that is why potato farmers also need to determine the amount of moisture in the soil as well as monitor and maintain moisture levels. The traditional test they use to know if they need to irrigate their crops is to throw a clump of soil up into the air to see if it breaks apart or not. Irrigation systems are used to control soil moisture and temperature more accurately. The irrigation system is often used on soil that is medium to light textured. You will know that your potatoes are ready for harvesting when the potato plants begin to brown and wither after a few weeks of flowering. Take note that you must dig them before a hard freeze. If you are storing the potatoes, dig them up after two to three weeks from the day the plant dies. Lay them out for two to three days under the sun but not rain. This way, the potatoes will dry out and mature the skin, and protecting them during storage. Q. What you use for seedlings in potato farming? A: Potatoes usually grow from the extra pieces cut from seed potatoes, this is called eyes of potato. Q. What is the soil requirement for potato farming? A: Normally the soil required for potato farming is loose, deep, light and well-drained. Potato trees are aggressive in rooting so light and loose soil is a huge advantage. These plants are grown through hilling process. You should add more compost at the time of digging. Q. What is the best time for potato harvesting? A: The best time to harvest potatoes is early summer to late fall but mid november to december is the best time to prepare soil. Q. What are the common threats for potato plants? A: Insect, pests and potato late blight are main concern for potato plants. There is no doubt in it that growing organic potato farming is a thorough and systematic process. Thorough research and preparation is very important to grow organic potatoes and to make best use of them. The potato chip business will click any season of the year because of its mouth-watering appeal to people from all walks of life. With this, you can earn big! I wanted to know if a lot of water can affect potatoes. I already have land in kenya and i would love to get a partner. i am from kenya, uasin -gishu district, moi's bridge area, i would like to start potato farming. Where can one get information on growing potatoes in Nyeri district, i.e. type, seeding rates, yields/ha to enable one make a decision on whether to grow the crop or not. HI! i dont know which potato seeds to buy pls cld u help me. I am looking towards growing potatoes that are for Chips. Dear Author, i would like to start farming potatoes too..i'm in Sabah, Malaysia..
Hi, I live in taveuni in Fji island and wondering it is a suitable enough place to to potato farming. The place is very hot at times and very wet too. We are planning to grow potato and would love to be guided. i want to build a potato chips processing plant and potato farm in ethiopia. I am a jr. high student and I am doing a report on potato farming and the person who wrote this was a very big help and I got a A on my assignment because of you and I am very grateful that you took the time to write this. Hi I live in Koster,in the north western province of South Africa.We have about two hectares of land and don't have any farming equipment,we would like to start a potato farming project so that we can provide for ourselves and sell the rest to earn a decent living.Can you please help me to start a potato farming business.The owner of the farm we rent said we can do whatever we want as he only uses the grazing for his cattle.In our country there are not a lot of opportunities for white males,so I would like to create my own job opportunity.Thank you very much. I have about 10 hectares of land in South Africa, Eastern Cape.I am interested in growing potatoes and i want to know everything there is to know about potato farming and to make it a successful venture. Kindly give information on establishing a potato farm. I have a 20ha plot in Chegutu about 125 km from Harare along the Harare to Bulawayo Road, in Zimbabwe. I have irrigation, overhead on 12ha & dripp on 4ha. I am a zambian based in kasama town city I have 30 hecters farming land i would like to start farming as a business but i dont know how to start from I am seeking ideas from you. here are some of the farming plans which i would like to do. Keeping pigs, growing irish potatoes, growing upland rice and poultry farming. Harare, Zimbabwe. I am interested in learning more effective ways of growing potatoes, can you please send me some comprehensive notes on how to grow potatoes. Please include land prep, fertilisers and pesticide and herbicide management. If you are looking for information on potato farming in Kenya, please try the KARI Potato Research at Tigoni in Limuru. I found very professional and knowledgeable staff especially a Mr Karinga. Good luck. I am in Zimbabwe and want to grow potatoes on a 10 hectare plot in Nyanga. I am interested in learning more effective ways of growing potatoes. May you please assist me with some comprehensive notes on how to grow potatoes, including land preparation, fertilizers and pesticide. I am in Harare and have small plot and want to learn how I can grow potatoes successfully. I have a 1 hectar plot which is about 25km South West of Harare, near Beatrice. It has a red soils. I would like to know what to watch out for if I want to plant potatoes using natural rain. Omphitletse, We have just started plating potatoes on our farm in Free State close to the Lesotho boarder. At the moment we have just completed 5 hectares and we are hoping to complete our planting by January 7th with an additional 5 hectares. To tell you the truth starting with just 5 hectares is sufficient for us. We are doing the extra 5 because someone has donated the extra seed for research purposes. We also secured services of a mentor whom we found his assistance highly valuable. we did soil tests as well as a result we have selected the optimal fertilizers. i feel there is a lot that we can share please contact me on shelile@lndc.org.ls. Good Luck. I am in Breyten in the Mpumalanga area. I would like to allocate about 1 hacter as a test of how to grow potatoes and to understand their needs. I am looking for a good potato seed. Want to plant it in Burma valley.Does any body know where i can source them. I am a Kenya resident who'd like to grow potatoes in western Kenya, Mbale to be exact. i need to know all I can about growing potatoes. i'd appreciate any guidelines or literature on such. thanks. i am a sierraleonean/guinean.i would like to grow potatoes in the futa jalloh highlands in guinea. please give me guidelines on how to grow potatoes starting with preparing the land to harvesting. Hi, I am a south african resident who'd like to grow potatoes in limpopo province (venda). I do have a land to farm on. The only advice I need is the basics or guidelines on how to grow potatoes from preparations to harvesting. I am in Zimbabwe and am starting a Seed Potato Farm up in the Nyanga Highlands. This is a new venture for me so I am looking for comprehensive advise on the growing of seed potatoes, starting with virus free mini tubers. With many thanks! I WANT TO START A POTATO FARM IN NAKURU, LET ME KNOW STEPS TO TAKE FOR ME TO BE SUCCESSFUL. @Issaiah, There are about 20 kinds of potato seeds available for farming, you have to see what kinds are available and good for your area. Here is the most commonly used pesticides like chlorothalonil, beta-endosulfan, methamidophos, azinphos-methyl, pirimicarb, alpha-endosulfan, metobromuron, metribuzin and metalaxyl. Can you tell me your farming area so that i can evaluate the approximate start up cost for your potato farm. I am in Jamaica with two acres of land, readily available water supply. Do I need to plant at a specific time as we have all year round warm weather? What is the best variety to grow? i'm a farmer in Zimbabwe located about 100km south of Harare. May you please send me notes on potato farming depending mainly on natural rain. I have a plot in Marondera Zimbabwe and would like to go into potato farming. Please provide me with details of the whole process. I'm in Goromonzi, 60km outside Harare, Zimbabwe. I like to grow potatoes on 2 hectares. Please advise me how to go about it and the expected yield per hectare. I live in kuwadzana Zimbabwe i have a peace of land which 1 hectare. Please advise me i want to grow potatoes. If may i ask do potato planting have seasons? Please help i want to plant them as soon as you you give the advice. God bless you. @Gerald Ranganai Chirandu, please see our FAQ section at the top, i have recently added few facts on potato farming, let me know if you have more questions. I am in Zimbabwe. I would like to do potatoes. How much seed do i need per hector? how much fertilizer is also required and when do i apply it? i am south african who owns 5 hectors of land in the e.c.i would like to start potato farming can you help with relevant information and funds to start. @Abid Mittha, Hi Abid Mittha, Well fertilizer depends totally on fertility level of individual field. I will suggest that while applying fertilizer at the time of plating it should not come in direct contact with seed and use fertilizer about 2 cups for each 30 feet. For exact amount please consult your local horticulture department with your soil. I am a mechanical engineer but I also love farming and gardening. I want to start a potato farm in Bukidnon, Mindanao, Philipinnes. I would like to know how much capital needed per hectare of farm and where I can buy potato seed (for french fries variety)? I intend to develop at least 10 hectares if I can secure enough capital thru partnership. I have land in Makonde, zimbabwe i tried to grow potatoes two years ago but i utterly failed.I need planting advices, fertilizers application, chemicals to put, where i can source good seedlings. I desperately need all the advice u can give me. I have a plot in Centenary, 150Km north of Harare, Zimbabwe. I want to put 3ha under irrigated potato. Kindly send me all necessary information on Potato farming. @Bernard Chinyimba, Hello Bernard Chinyimba, Well there are some important points which you have to know before starting a potato farm. The most important part is soil, potato needs clear soil and the soil should be well dug. The soil should not be so fussy it should be slightly acidic. At the time of digging soil add more compost and if possible prepare the soil in mid november and december so that it will get some time to settle before planting potato. In our FAQ section we have added some more points recently which may help you. If you need more information just let us know. hey, i'm from America... i was wondering how many acres is reasonable for a potato farm??? hey, i have a piece of land to start potato farming. My farm is in the central part of Botswana. Can u plz advice me on how to start potato farming on a smaller scale or connect me with potato farmers around Botswana/South Africa border. I wish to go into potato farming. I am in the Marondera area of Zimbabwe. Please provide me with all the relevant information to start a potato production project on a ten ha plot. I'm from gweru in Zimbabwe.I have 20 acres of black and red soil and would like to grow potatoes. could i please have all the possible information to help me.thank you. I would like to grow 1ha of Potatoes and i am interested in all relevant information that i need in order to effectively grow my potatoes. i therefore need information on land preparation, fertilizers, pesticides and herbicides, as well as labour cost. norah valley 10km off the hre to mutare road,can u pliz assist with the initial cost of growing i hectare and were i can get a loan coz my farm has got title deeds and also send me information on how to grow them from the start up to the maturity or selling stage i need everything for my proposal n the farm i m talking about is a very very big farm with 7 paddocks for cattle rearing and vast arable land. hi i'm in chiwundura,gweru,zimbabwe.i want to know the process of farming potatoes from the day i get the seed. I have a farm, the manpower, irrigation and the knowledge on how to grow potatoes but I do not have money.. please help with capital. I am a nigerian but lives in sourth nigeria,i want to know how to start either potato farm or tomato farm,i will need a guide,from day of planing to harvest.thank. i just completed my certificate in agric living in masvingo i want to start potato enterprise on 3 hectors so can u give me all required things. I want try potato farming in the Philippines. What is the ideally minimum land requirement for potato farming. I want to start a small scale farming. Thank you sir and more power. I have land in Gweru (Somabula , Zimbabwe) area and I wish to start potato farming. I am looking for advice on which type of potatoes, fertilizers, chemicals, best time to prepare the land, when to plant and all the information required to start up this project and also any information on which plants are best suitable for the area. Your help will be very much appreciated. Would like to undertake potato growing as a cash generating project. Need to know about the steps taken from land preparation to harvesting, amount of seeds required per hectare, fertilizers and other inputs. To be done in Chimanimani in Zimbabwe. i live in southern zambia and would like to start growing potatoes on my 5 Hector piece of land, the land was previously used for tobacco farming by the previous owner. i need advice on varieties most suitable for the area, fertilizers and the best time to grow them. I am in Harare, Zimbabwe. Could you send me notes on potato growing i.e from land preparation to harvesting and the input requirements.